2019, huh. So far, gotta say, not lovin’ it. To be fair, it’s been an especially challenging two weeks. We opened the year with a funeral for Tech Support’s mother, a wonderful woman who is already deeply missed. Air travel and stress led to illness, which led to cancelling my first school visits of the year… and also attempting to write while my brain was cocooned in bubble wrap, thanks to manuscript revisions that had to be turned around very quickly. 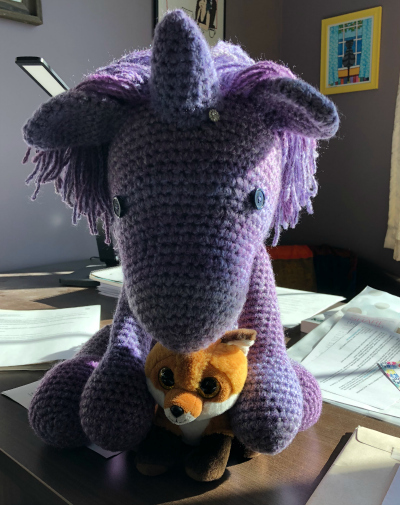 Is it any wonder that both Fox Cousteau and I have been snuggling our Emotional Support Unicorn for the last two weeks? But what’s that they say about nowhere to go but up?